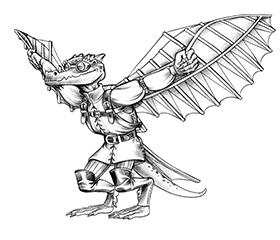 As we kobolds are fond of joking: “Dragon!! !” But seriously, mithral? Where’s the candy floss dragon? Like staying alive isn’t hard enough already. 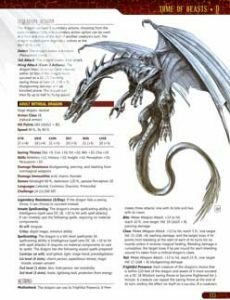 The mithral dragon spits metal shards. That’s how badass [and completely metal \m/] they are. 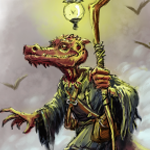 This shiny partykiller was originally designed by Mike McArtor and updated to 5E for the Tome of Beasts by Chris Harris with art by Guido Kuip. Sure, Chris: ambassadors. And when they get hungry? I’ll just let you do the talking. This and hundreds of other monsters will be available very soon from Kobold Press. You can pre-order the Tome of Beasts now! As a backer of this item, I can barely wait until this is released! Thanks for sharing! This is sorely needed because we have tons of miniatures we want to put on the gaming table, and now we will have stats for them! Boo WAaa HAHAHA! Oh, did I just type my laugh out loud? Also very exited about the upcoming Tome of Beasts (I’m a backer). Will this come with a CR table?